Atlas Minerals has long been an industry leader in the field of concrete and steel protection in aggressive environments. Polymer coating solutions for extreme exposures of caustic and acidic conditions are just one of the routine recommendations for the Atlas Corrosion Resistant Construction Materials (CCM) group. Atlas manufactures fluid-applied systems that can stand alone or be reinforced for secondary containments, floors and difficult linings that are found in the Water Treatment, Power and Process Industries no matter what the service conditions. Acid Brick and polymer systems may be custom designed to work together in a hybrid system that will tolerate both the abuse of heavy equipment traffic and chemical attacck while maintaining the protective integrity of the system. 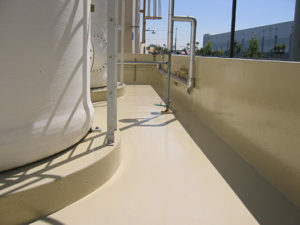 The CCM products also offer several polymer modified concretes that exhibit not only outstanding chemical resistance, but feature rapid return to service properties.